At the beginning, the main intention was simply to organise a marathon event. Being a unique city in terms of history and geography, Istanbul deserved a unique marathon. Despite the financial and logistical problems, an initial project was set up for the Eurasia Marathon. In 1978, the officials were informed that a group of German tourists would visit Istanbul the next year, who run marathons in the countries they visited, the Nile Marathon in Egypt being the most recent race they participated. It was then decided to realise the Eurasia Marathon project. Having solved the problems with the course and the traffic, the organisers invited the elite Turkish athletes to the event as well. Finally, all preparations were completed and the marathoners whom 34 of them were from the 74-person tourist group gathered at the starting point, 700 meters behind the Bosphorous Bridge on that historical day. Thus, the Bosphorous Bridge witnessed a marathon for the first time in its history, which the runners crossed from Asia to Europe. That was the beginning of an important event. 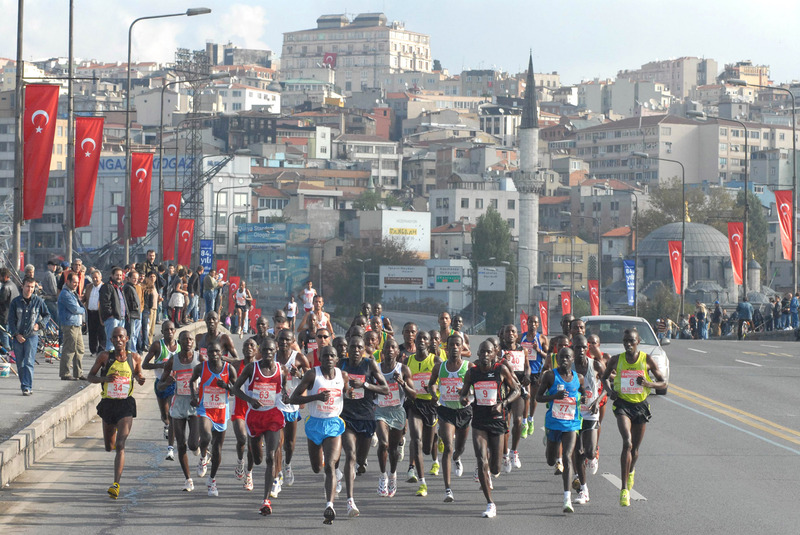 The first Eurasia Marathon was won by Hasan Saylan, a Turkish athlete from the city of Zonguldak, in a time of 2:35:39. Being organized for 30 years, one of the most important features of the Eurasia Marathon is that it aims friendship and peace since day one. The race course changed three times over the years, therefore winning times vary in those periods. Well known athletes such as Ian Thompson and Terry Mitchell participated in the Eurasia Marathon, which also became a testing ground for Turkish athletes, many of whom went on to run at international races. (2018) Kenya’s Ruth Chepngetich stormed to a Turkish all-comers record at the 40th Vodafone Istanbul Marathon on Sunday (11), clocking 2:18:35 at this IAAF Gold Label Road Race. Felix Kimutai made it a Kenyan double with his 2:09:57 victory in the men’s race, also the fastest time ever run on Turkish soil. With a 2:22 pace initially in mind to try breaking the 2:22:36 race record she set in her debut last year, Chepngetich surprised organisers at Saturday’s technical meeting when the defending champion asked that intermediate times be calculated for a sub-2:19 run. Having noted those, the 24-year-old went in pursuit of exactly what she targeted. Leading from the gun, Chepngetich opened her bid with a 16:13 opening five kilometres, already four seconds ahead of her compatriot Margaret Agai, with Fatuma Sado of Ethiopia following behind closely. While Agai and Sado did not attempt to maintain the pace, Chepngetjch reached the 10 kilometres mark in 31:59. Agai was 30 seconds behind at that point, with Sado another 27 seconds adrift with Ethiopian Zerfie Limeneh on her shoulder. Chepngetich confidently passed the 15-kilometres marker in 48:15 before reaching the halfway in 1:08:22, ahead of world record pace. She increased the gap to nearly three minutes at 30 kilometres where she passed at 1:37:42, and cruised onwards to her 2:18:35 performance to end the day in a tie as the seventh fastest women’s marathoner of all-time. Agai was a distant second in 2:25:04 with Sado third in 2:31:05. (2017) Despite a 23km/h headwind between the 10th and 26th kilometres, Kenya’s Ruth Chepngetich shattered the Turkish all-comers’ record at the Vodafone Istanbul Marathon, winning the IAAF Gold Label road race in 2:22:36. Seven months after her surprise 1:06:19 course record victory at the Vodafone Istanbul Half Marathon, Chepngetich sliced nearly five minutes off the long-standing race record of 2:27:27, set by Ethiopia’s Ashu Kasim Roba in 2010. The 23-year old, who ran shoulder to shoulder with her compatriot Visiline Jepkesho for 40 kilometres, crossed the finish line four seconds ahead the pre-race favourite. A group of six athletes – including Ethiopian trio Letebrhan Haylay, Mulu Seboka, Sinke Dessie and Kenya’s Sharon Jemutai Cherop – led the field from the gun, passing 10 kilometres in 34:53. Having to battle strong winds thereafter, Chepngetich, Jepkesho and Haylay proved to be the strongest athletes and had built up a 300-metre lead over their rivals by 15km, which they reached in 52:09. The trio passed half way in 1:11:53, suggesting a course record was highly likely, and were still together up to the 27th kilometre until Haylay started to lose ground. It then became a race between the two Kenyans and, surprisingly, it was the inexperienced Chepngetich who coped better with the difficult uphill section towards the finish line. 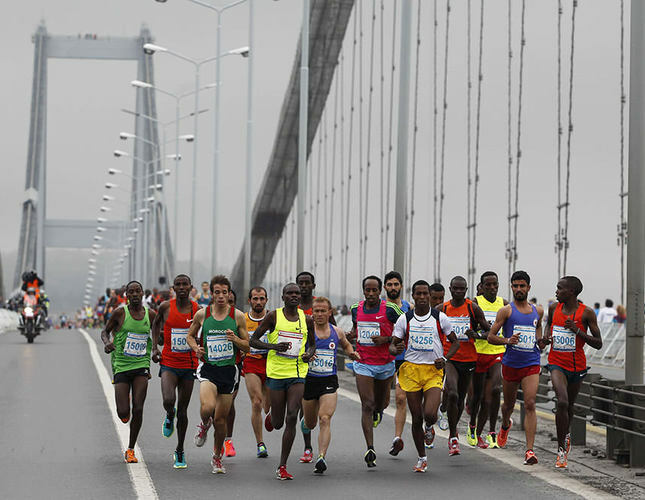 The Marathon race starts 250m behind the 15 July Martyrs Bridge, race course divides in Besiktas turnoff after passing bridge, after this goes down from Barbaros Boulevard to Besiktas and follows the coastal road it reaches Karakoy. Runners turn onto Sirkeci, after the Galata Bridge and goes to Atakoy. The race returns from Atakoy Air Force Academy and continues from coast to Gulhane Park and goes through the park towards to the Blue Mosque. Hippodrome, which was the meeting and sporting centres of Romans, Byzantium and Ottoman Empire, is finish point. The finish line is between entrance gate of Blue Mosque and Egypt Obelisk.